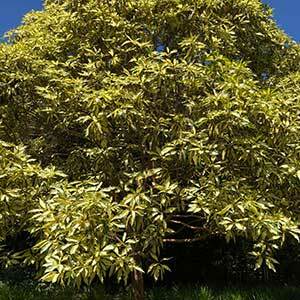 A small to medium sized tree, Lophostemon confertus Variegatus with its attractive green and yellow variegated foliage, makes an excellent shade tree for a medium sized garden. Unusual and not widely found in cultivation as is the species Lophostemon confertus. Tolerating many of the problems that urban areas can through at it, as well as frost, poor soils and being reasonably drought tolerant, this variegated form is best in a position with some protection from the extreme heat of the afternoon sun. Tolerant of a range of soil conditions, including poorer soils as well as seasonal wet soils. Best in a sunny position with room for the crown to develop fully. Although not widely seen in landscaping applications, this is a very attractive small to medium tree with a spreading canopy. An excellent shade tree for parks and gardens. Excellent as a street tree in urban areas, where it will survive conditions as well as some shade from tall buildings. Soil – Tolerant of a range of soil conditions, will perform best in a humus rich well drained soil. Height – To 8 -12 in height. Spread – Will form a canopy of 7 metres plus. Foliage – Mid green with yellow variegation.